The bougainvillea plant grows in the biome of the Amazon rainforest in South America. The Longitudes of the biome are 35û West to 65û West and the Latitude, 15û South to 5û North. The countries that lie in this biome are Brazil (mostly), Bolivia, Peru, Ecuador, Colombia, and Venezuela. The rainforest has thousands of plant species and is the home for many animals, too. Bougainvillea's habitat could not be greener. It has lush vegetation with thick forests. It is a tropical rainforest. There are two seasons in the Amazon, wet season and dry season, both have very high temperatures. The temperatures of the Amazon rainforest are, at night 68û F (20û C) and in the day 85û-90û F (30û-32û C). The rainforest gets an average of eighty inches of rain a year, as opposed to the desert, which gets just ten inches, average per year. Bougainvillea likes a climate from subtropical to tropical, but prefers a tropical climate, growing in dense forests where it can cling and grab onto other plants to reach the sunlight. It can tolerate semi-shaded areas and it can also tolerate full sun, but when vine-like it tends to climb upward towards the sun. Bougainvilleas do not like swampy areas because of the lack of soil drainage. It can live with a lot of water it just doesn't like to hold the water for long. The plant can reach over thirty feet. It can either be vines, trees, or shrubs with sharp thorns. The leaves of the bougainvillea are shaped like little hearts with drip tips at the ends. They are dark rich green and look almost like ivy leaves. On the underside of the leaves there are little hairs. The flowers of the bougainvillea can be several different colors, from pink, to red, to orange, to white and yellow. They are small tubes with three papery bracts around them. The flowers grow all over the canes and vines. The root system of the bougainvillea is very fragile and doesn't form a good firm root ball. 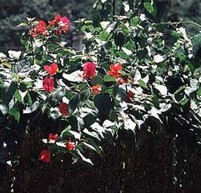 Bougainvillea has many adaptations to its climate and environment. It has many hooks so it can cling and hold onto other plants for support. Also, it can grow in full sunlight to semi-shade. It also has become a houseplant so it can survive house climates, and the Amazon's warm wet climate. The leaves have drip tips so it can get rid of the rushing water fast and not get weighed down by the water. The plant of bougainvillea is very abundant in the wild and is not endangered at all. It is not endangered because when it is vine like it spreads very quickly even though it does not have seeds and also it is almost insect-free. Great thorns protect it. In conclusion, the bougainvillea is a very wonderful plant and has its own unique way of life. It leaves and flowers are very unusual also. It can grow in many different ways from shrubs to vines to trees. It also lives in a very interesting place. Crocket, James U. "Flowering House Plants." Time Life Encyclopedia of Gardens. 1971 ed. Taylors Mastor Guide to Gardening. Woughton Mifflin Company, 1994. "Amazon maps- World Rainforest and Amazon Co countries." "Bougainvillea." Wyman's Encyclopedia. 1971 ed. Phil and Jean Hovey. "Plant Answers." http://www.plantanswers.com/bougainvilia.htm (2/10/03). "What Does Adaptation Mean?" http://mbgnet.mobot.org/sets/rforest/ (2/10/03).